Sample Karmeliet Tripel with a stylish Karmeliet stemmed glass. Tulip shape not only helps trap the aroma, but also aids in maintaining a large head, creating a visual and olfactory sensation. Karmeliet logo and frosted fleur-de-lis band complement the elegant, curving shape of the glass. Approximately 8 1/4" H x 4" diameter (at widest point); holds 22 oz to the rim, marked at .3 liter or 10 oz level. Four 11.2 oz. bottles plus one stemmed glass; a great gift for the beer lover in your life. Karmeliet Tripel (ABV 8.4%) uses a recipe based on one created in the 17th century by the Carmelite monks of Dendermonde. It calls for three types of grain—wheat, oats, and barley. Pours medium gold and clear with a creamy white head; the mix of grains gives a dry, crisp and refreshing flavor, with aromas of citrus and spice. A restrained hop bitterness balances flavors of toffee and malt. Brouwerij Bosteels (Bosteels Brewery) is a brewery in Buggenhout, Belgium founded in 1791 owned and operated by the same family for seven generations until its sale in 2016. 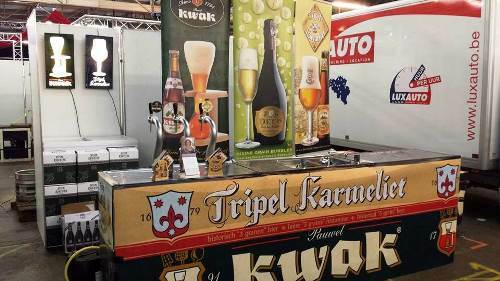 They brew three beers: Tripel Karmeliet, DeuS, and Pauwel Kwak. It's our favorite Belgian beer! We love Karmeliet and drank it often while visiting Belgium. I was so glad to see you offered a gift set with the glass because after returning home I accidentally broke my partner's glass he purchased and brought home as a souvenir. Thank you for your excellent packing and assuring stellar freshness and superb taste of the beer! Apr 3, 2016 | By April N.
I bought this beer set for my dad's birthday and he loved it. After visiting Belgium he mentioned he loved this beer, Karmaliet Tripel. This was the only place online I could find a good quality beer set of this kind. My dad said the beer tastes just like the one he had in Belgium. The glass in this set is actual glass. I wasn't sure if it was going to be plastic or glass but it is indeed glass. The kit came well packed and wasn't worried about anything breaking. This set comes with 4 beers and a nice big glass just like it says. Great quality set! Very happy with this purchase!